When Women’s Golf Head Coach Julie Garner was announced as the 51st inductee of the Women’s Golf Coaches Association Hall of Fame, the Rollins community was happy, but by no means surprised. Garner’s glorious career has helped shape the history of Rollins athletics, and there is something quite solemn about the way she helps her players through the beginning of their adult lives. “It sounds like an individual honor, but I really accept it for all the people that have supported this program ever since our first championship title in 1948,” a modest Garner said. She dedicated her achievement to the pleiades of players that have graced the Rollins golf program throughout the decades, including Alice Dye (‘48), Betty Probasco (‘51), Barbara McIntire (‘58), Jane Blalock (‘67), Hollis Stacey (‘73), Muffin Spencer-Devlin (‘76), and her mentor both on and off the golf course, Peggy Kirk Bell (‘43), who she credits with validating Rollins’ golf program. According to Garner, the entire school benefits from the program’s success: “When one of our programs wins, we all win.” She cherishes the combination of athletic and academic achievement at Rollins. 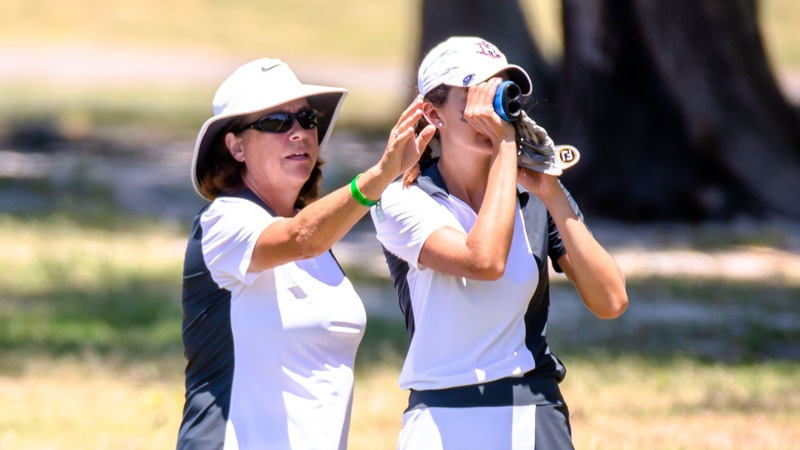 The Women’s Golf Coaches Association has been honoring astounding coaches and promoting student athletes since it was founded in 1983. Satisfied with the Tars’ third place in the inaugural Rollins Legends Invitational, Garner emphasized the relationship between Rollins and the local golf community. “We play and practice quite a bit at Winter Park Nine and Interlachen. When Country Club Orlando stepped up to host this fall tournament, it was a great way to end,” she said. With no seniors in the roster, the women’s golf team is young. Garner, however, pointed out that the national championship experience of Seher Atwal (‘20), Selin Timur (‘20), and Lara van Staden (‘21). “If we continue to improve our short games, chipping, putting and bunker play, hopefully our stroke average will continue to go down and we’ll be competitive in May when the postseason starts,” Garner said. In 23 seasons under coach Garner’s leadership, the Tars were Division II champions six times, including a four-year title hegemony from 2003 to 2006, and runners up on five occasions. Credited with saying “happier golfers play better golf,” Garner finds the roots of satisfaction in determination. “Not everyday is going to be filled with sunshine, roses and joy, but we have to remember what brought us here, why we play this game,” she said. Her success at Rollins put her in the radar of Division I programs. But after every interview, it became increasingly clearer to Garner that the grass was definitely just as green, if not greener, right where she stood. Garner believes the key to success is the combination of the academic and athletic ability which allows the team to be competitive. “I joke about how I’m just the one driving the van and paying the bill at Starbucks. Other than that, if you have any coaching ability at all, you’d be very successful here. Rollins is just that type of place,” Garner said.